We all want to plan the epic party for our kids! 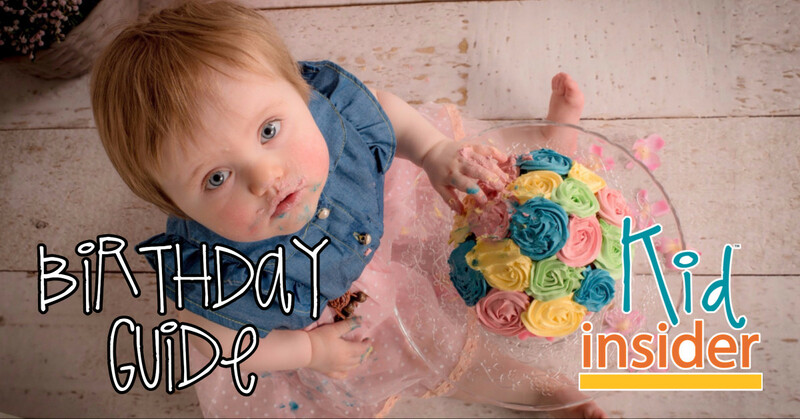 The Whatcom Kid Insider Birthday Guide can simplify your party planning to-do list by helping you locate the perfect party place to celebrate your child's birthday. 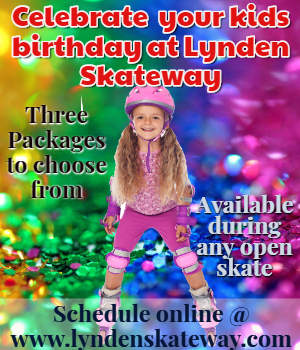 Each package includes different options & add-ons. 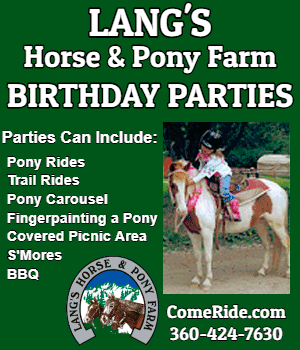 Testimonial: "We just celebrated our daughter’s third birthday with Lang’s. It was such a great experience -all of our guests had the best time. They are very reasonably priced and were super accommodating! We will be back for lessons for sure! "~Chelsea J. Choose from a selection of exciting themes, such as: Disney, Under the Sea, Lego, Outer Space, Science or design your own theme! 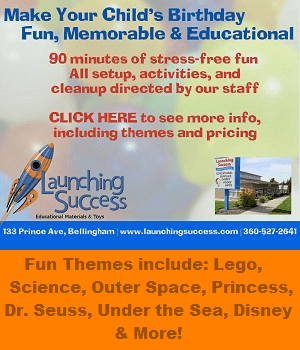 Testimonial: "Went to a birthday party here today and it was great! The 9-year-old boys all had a blast and the two guys running the show were amazing! 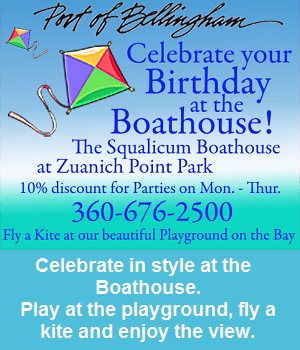 They played nerf wars with the kids then ran a great obstacle course.~Meagan S.
The Squalicum Boathouse is located at Zuanich Point Park. Its natural surroundings and stunning water view make this location irresistible for any event. Fly a kite with the kids, watch the kids on the playground and enjoy the gorgeous view! This facility offers a large fireplace, full kitchen and buffet area. If you rent Mon-Thurs get a discount. 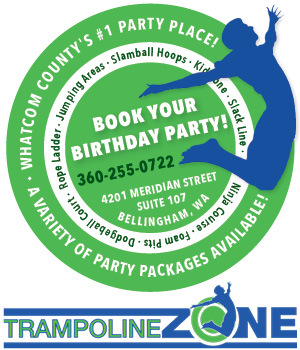 The Trampoline Zone is Bellingham’s finest indoor trampoline park! Their 18,000 square-foot facility includes two foam pits, ninja course, kid’s zone, and designated areas for dunking, dodgeball, and just plain ‘ole jumping! 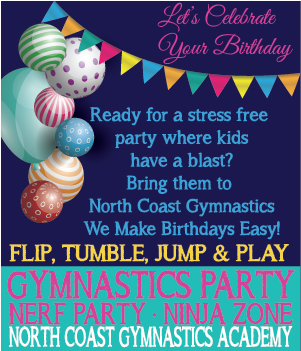 It's a great place to have a birthday party! 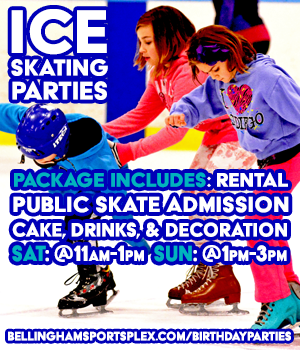 Testimonial: "I rented a room for my daughter's birthday party. My daughter and all the kids had such a blast!!! The party host was so kind and helpful. "~Lyndsi F.